Now that Shazam! is almost out in cinemas and the review embargo has lifted, the positive reaction so far suggests that the latest DCEU film could end up being the most popular one yet, and as the post-credits scenes suggest, there’s plenty more mileage in the character and concept. If you’ve seen an advance preview of Shazam!, you’ll know what I’m loosely referring to, but if you haven’t seen it yet and want to save those surprises for when you do, be warned that serious spoilers are everywhere in this Shazam! post-credits scenes analysis. Got it? But, if you’ve already seen the film or simply can’t wait to find out what is teased for the future of the DCEU in the post-credits sequences, then you’re going to want to read on. There’s a lot to chew over with these additional sequences, so join us for a full recap combined with some wild speculation. Still here? Then read on to find out what happens in both Shazam! post-credits scenes and how it might impact on the future of upcoming DCEU movies. Right, so let’s get down to details. For starters there are two post-credits scenes (and that’s not even including a last-minute Superman gag that has the feel of a sting, even though it actually appears just before the credits to round off Billy’s story). And, before I get to the post-credits scenes themselves, can I just say how wonderful the animated credits themselves are? Scrawled in the style of doodles on a school exercise book, the animated scribblings have the same sense of humour and heart as the film itself, and are a nice way to have fun with Wonder Woman, Batman, and Superman: established superhero characters that are hinted at throughout Shazam! It may not add to the DCEU continuity, but it’s a lot of fun. As is becoming something of a tradition for comic-book movies, the first of the two post-credits sequences – the mid-credits sequence, if you will – is the more dramatic and plot-significant of the two. Here you learn that Mark Strong’s villainous Dr Thaddeus Sivana, who was roundly trounced in the film’s final-act showdown at the funfair and stripped of his seven deadly sins-based powers, wasn’t killed in that big battle (as you’d kind of assume) but has instead been incarcerated in a thickly padded cell. If the wall scrawlings are anything to go by, he’s spent his entire time inside drawing the seven magic symbols that enabled him to get to the Rock of Eternity in the first place. You know, that magic temple-like place where Djimon Hounsou's ancient wizard was waiting to bestow powers on a worthy champion? And yeah, Sivana wasn’t worthy, so when he eventually found his way back there, he teamed up with the seven deadly sins monsters to become a supervillain. But it seems that now, his frantic scribblings are not allowing him to return to the Rock of Eternity – possibly because Shazam broke the wizard’s staff after giving his foster siblings powers. The scene then gets delightfully weird, when a worm-like creature who’s something like a sinister version of the caterpillar from Alice in Wonderland appears at the window and starts laying out a plan of action for Sivana. “You assume there’s only one way to get magic,” teases the little creature. That’s pretty much it for the scene, so you might be left wondering who the little worm guy is. He’s actually briefly glimpsed earlier in the film (in a non-speaking part) residing in the Rock of Eternity. It’s not clear what he’s doing at that point, or that he’s even sentient, as he seemed like a bit of a quirky background detail. But he’s presumably Mister Mind, a supervillain from the comics. In the comics, he often works alongside the Monster Society Of Evil (there’s really no ambiguity if you call your organisation that, is there? ), and has teamed with Sivana in The New 52 run of the comics, from which the film most closely takes inspiration. In the comics, Sivana goes on to summon Black Adam as another foe for Billy Batson/Shazam. Could that be on the cards for the future of the film series? Dwayne ‘The Rock’ Johnson has been attached to the role of Black Adam for years now, and while he gets an executive producer credit on Shazam! – which does make you wonder if a cameo might be in store – he sadly doesn’t appear anywhere in the post-credits scenes. Given the hugely positive response to Shazam! thus far, I can’t imagine that we’ll be waiting too long for a sequel to be announced, and introducing The Rock’s Black Adam would be one way to take the buzz around the property to new heights. The appearance of Mister Mind only adds to the bonkers sense of fun in Shazam! The DCEU initially attracted a rep for being super-serious and dour, and it previously overreached by rushing into crossover films like Batman v Superman and Justice League. Now that they’ve changed tack and are focusing on unique standalones (see Joker or James Gunn’s The Suicide Squad reboot) and fun solo movies (Aquaman became the biggest DC movie ever recently), they seem to be hitting their stride, and Shazam! is easily one of their most enjoyable movies yet. The introduction of Mister Mind suggests they're only going to dial up the silliness from here, and I’m all for that. And talking of silliness, that leads us on to the final Shazam! post-credits scene, if you hang around until the very end, past all the song details and ‘No animals were hurt during the making of this film’ disclaimer. In keeping with recent tradition, this is a more fun, throwaway additional scene. 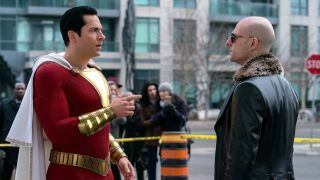 It’s not 100% clear where in the chronology of the film this takes place – it could be following the events of the film, but it seems more likely that it’s taking place somewhere around the mid-point of the film, as Billy/Shazam is having his powers tested by foster brother Freddy – if it was happening after the events of the film, wouldn’t Freddy be testing his own powers? If you’re looking for even more details on the latest DCEU movie, check out this Shazam! on-set report featuring interviews with the cast and crew.